Shannon Winslow is an author who has trod down the path of Austen sequels before, but this is her first novel to focus on Austen’s life rather than the lives of her characters. I was unfamiliar with Winslow before beginning this novel; as such, I found the first 25 pages or so to be a bit factually incorrect, as in the mention that Jane spends a good deal of her writing profits on household upkeep, and the HORRENDOUS misspelling of Austen’s friend Alethea Bigg’s name as “Althea.” The horror! My Austen alarm (aka the “My JASNA Chapter and I are the only ones who truly know Jane Austen” alarm) went off. Thankfully for me, though, I fell off of my snooty high-horse fairly quickly when I got further in and just let myself enjoy what turned out to be a detail-rich and gripping read. 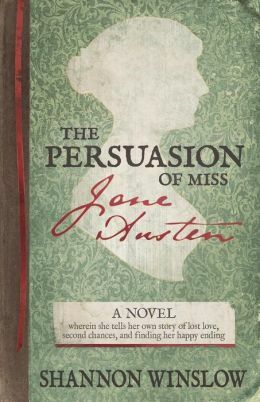 Winslow hypothesizes that PERSUASION was written with a very heavy dash of Austen’s own experience with love. Jane meets a French naval captain, Captain Devereaux, at the wedding of her brother Henry and Eliza de Feuillide. She is immediately taken with him, as he is with her, and so begins a whirlwind romance for Austen, at the spinsterish age of twenty-seven. Much as Wentworth, Devereaux has little in the way of wealth, but he is sailing out with every opportunity to distinguish himself. Jane’s parents, however, refuse their consent for the match. So Jane severs her ties with the captain, leaving him angry and hurt. The remainder of the story follows very closely that of PERSUASION, with the pair drifting in and out of each other’s lives for the next fourteen years, bringing us to Winchester, to Jane’s terrible illness. I won’t spoil the remainder of the book. The novel takes a fantastic twist in Winchester. Winslow, in my mind, entirely redeemed herself from her earlier minor factual errors (I was reading the book with my alarm on stand-by…). Austen left so little in the way of letters, especially after Cassandra did away with the ones she felt were too personal, to entirely fill in the blanks in some of the years of her life. Thus novels such as this are born, books that refuse to accept that this “quiet” Regency author lived and died an old maid.